The post was originally published in my school’s blog, CambridgeLearns, on October 4, 2015. This past Friday afternoon after a busy week at school, many Cambridge staff members participated in a few fun social events. First, we headed over to the Bose Corn Maze where we had a great time answering trivia questions and navigating our way through the corn in teams. 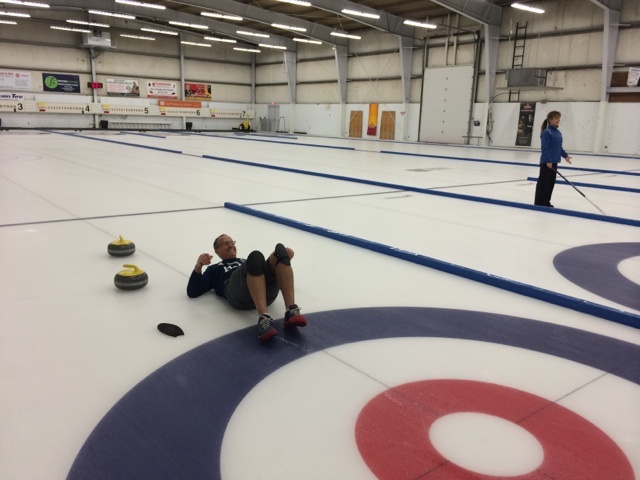 However, this learning story is much more about the second event – Curling. I’ve watched Curling many times on television, but never appreciated the amount of skill involved. I very quickly found myself on my back after trying to actually curl my first stone. I wasn’t really embarrassed because I know that while everyone had a chuckle, no one was making fun of me. As I continued to try, and try really hard, I began to grow frustrated that I was struggling so much with a task that others made seem so easy. In fact, some teachers who had never curled before looked like experts right away! My struggles had nothing to do with the instruction either. Our teacher broke down the task into small parts, modelled these, and gave us ample time to practice. I just was not going to catch on to this activity without more time and practice. In that moment, my mind immediately went to our students…your children…who are asked every day to put their learning out there, to risk-take, and to try things that are very difficult for them. I thought of the feeling many students have when they struggle to learn new things. That’s why I think it’s always important for us all – principals, vice-principals, teachers, parents – to be learners too. When we put ourselves in these positions – positions where we play the role of the learner – we are made conscious of what it feels like be a little afraid, to take risks, to struggle, and most importantly to persevere and see ourselves get better at something. Despite the quality of our instruction, not all students will grasp concepts the first, second, or maybe even third time around. I think the most important lesson we can teach children is to always work hard and to keep on trying because with enough time and practice, any of us can be great at something. When is the last time you put your own learning out there?